Maxwell, hoomins don't like mouse guts...sorry! Cause you can't mix catnip and mouse guts! Hey Maxie, you are clearly not communing with the right mousies! Maxwell, we wonder the same thing! We like crunchy bugs but our Mom makes the most dreadful sound when she sees us gobbling them. Just imagine their reaction with a real mousie! Ps-Just have fun with the toy mouse. Right??? Who thought fluff was better? Hey, that's a really good question! Excellent question........I'm SURE mouse guts would be a lot more tasty than FLUFF......!! Maxwell, you need to shop at a different store to get the mousies that are stuffed with guts. They are if you catch a REAL mousie! If you ask my cat bro Bert he will tell you it doesn't matter. He eats stuffed mice just like real ones. Silly boy! Because the humans don't want to clean up mouse parts! 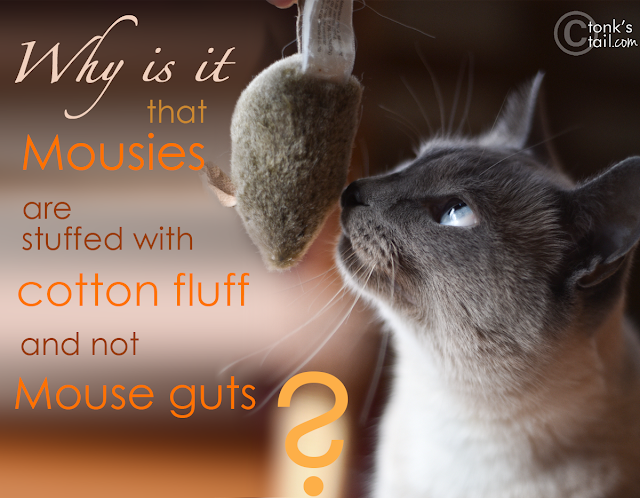 Also ... dead real mousies stink ... dead cotton mousie?!? No. Especially good for those kitties who bat everything under furniture. You're right, Maxie. What a rip off! That really needs a cat-world-wide purr-test! At least instead of cotton fluff, they could have put catnip in them, at the taxidermist!